We intercepted this report on the state of the cancer industry and the recent call by the president to cure cancer. It provides a better understanding of what is going on. In considering the state of the union of cancer therapies and the medical pharmaceutical complex, alarming headlines occasionally appear, worrying some. The purpose of this article is to put you at ease. The war on cancer is going well, cancer is still winning. If this is so, then how should we view the headlines that occasionally pop up? In spite of the fact we are told some cancers are inoperable, there are anecdotal stories of patients being sent home to die (normally a demoralizing fact that encourages giving up all hope), and finding alternatives where the cancer looses the battle. Some want to play the blame game, saying had the doctors been more aggressive the cancer may have won. Some say the doctors were mistaken, the patient did not really have cancer. Others blame the patients, saying they successfully exceeded their expiration dates by sometimes many years was the result of starting the Water Cures protocol. To our consternation, the natural way of treating cancer again and again is succeeding. This even though there is little evidence based science that has been bought and paid for by natural cures special interest groups. Thankfully, there is little or no profits to make them even consider such an idea. Thankfully, there is no science to prove that the natural cures actually cured anyone and there is no proof that they even work. Cancer industry insiders call this a win for cancer. How do we even know that those using natural cures are even alive? There is no peer reviewed science to prove it. All we have is their word for it. While an unfortunate outcome for the cancer industry and the medical pharmaceutical cancer complex on the whole, cancer is still winning the war. So long as the alternative treatments like Water Curses, Gerson, Hoxey, and so many others don't go main stream and so long as doctors like Nicolas Gonzalez, MD who has been successful ending pancreatic cancer keep dying, cancer will keep wining the war. You don't know who Dr. Gonzales was? Then you need to see his video on You Tube. We need to stop videos like this and his other videos from being seen. Warning, the information you will view here is very disturbing if you are a cancer iudustry stock holder. He was successfully treating pancreatic cancer, even though in main stream health care, we all know that pancreatic cancer is a death sentence. The only realistic way for the War on Cancer to be slowed down was for the good doctor to die, even though he was in good health. While it is sad to report that several natural doctors died around the same time in Florida (because we did not get to treat them for cancer), the battle is far from over. As pundits hope that the War on Cancer will be lost, a new campaign calling for the end of cancer has been launched yet again by the President of the United States. Wait, which president? And what was the fine print that always exists in any political statement? What was the sub-text or real headline that we only find out about years later? In 1971 the then president Nixon declared war on cancer. This was a brilliant way to keep the masses from learning about the natural treatments that were available. If the very people supporting the Medical Pharmaceutical Cancer Complex appeared to be uniting to start fighting to destroy cancer, nobody would be any the wiser. With some setbacks, fortunately, cancer continues to win the war. In the book, The Cancer Treatment Revolution (2007) it pointed to significant progress using the so called “smart drugs.” Other researches likewise have claimed progress. In order to accomplish this, they used a very old tactic, propaganda. By cherry-picking the cases where there was success and not looking at the failures, it is possible to make the outlook better than it actually is. The reality, Gina Kolata pints out in the New York Times that there has been little real progress on the war on cancer when looking at statistics from the 1950's. (read: Cancer 1, Natural Cures 0). This is awesome news. Sadly, there are some metastatic cancers that seemingly can, on occasion, be cured with chemotherapy and/or radiation therapy. Fortunately, even if these are cures, they are only a very small percentage of the larger cancer statistics. Some say that those who got better did so in-spite of the treatments. Either way, we can thankfully say, cancer is still winning. The area where cancer may be losing the battle when treated with chemo include, testicular cancer, choriocarcinoma, Hodgkin’s and non-Hodgkin’s lymphoma, leukemia, and rarely cases of breast and ovarian cancer. Even so, some cancers can be made into profit churning chronic diseases requiring daily treatment such as some leukemia's. The occasional testimonials of those who have successfully cured their cancers using alternative treatments as simply viscous lies spread by the competition. They don't realize peoples lives and livelihoods are at stake here. If a cure truly existed, think of how many big pharma execs and oncologists that would be left second and even third homeless, losing both their weekend home in the country and their summer home in the islands. If you are a stock holder in a cancer pharmaceutical stock, there is no need to worry. There are still profits to be made. Consider lung cancer. While it is easily eliminated with natural treatments that cost a fraction of the chemo therapies, most patients are unaware, thanks to our paid shills that spread the word. The message is, "If a treatment has not been studied, it cannot work." Thankfully statistics show that lung cancer takes most of its victims inside of a year, leaving enough time to make nearly 1 million in profit. Rarely (about 15%) do some last 5 years allowing for additional profits. The natural cues people fail to consider let alone share all the facts when they tell their stories. There was one such natural cure used on an 82 year old woman treated in McGill University Hospital with stage 4 lung cancer. You never hear them say that the patient still died. While she lived to 94, the point is, she still died. The treatment, a bonded whey protein isolate discovered by a Canadian doctor Gustavo Bunos thankfully did not become main stream. Many wonder, if you cure people, there is no long term profits so how would a business keep viable. There have been other setbacks. Early detection of invasive breast cancer by screening is good; however, about 62,000 cases of ductal carcinoma in situ (DCIS) are also found yearly (American Cancer Society 2009). In more than half or one out of every two women, especially those who are older, these will not get worse and do not need to be treated. By the way, we were behind that study and thankfully, most women do not know that simple dietary changes can eliminate the risk altogether. Because it is impossible to predict who will get worse unless you are using one of the wacko natural cures like, eating a healthy plant based diet and avoiding cancer promoting foods, the American Cancer Society (2009) recommends all patients with DCIS get therapy which is generally breast surgery. Thus, over thirty thousand women a year who do not need it, get treated (read: get their breasts cut) every year (Evans et al. 2009). Calls are made for the need to figure out which DCIS are harmless in order to avoid unnecessary treatment. Some have even said that breast cancer screening has a small but positive net benefit (Esserman et al. 2009). We feel, 'What is a little inconvenience compared to saving your life (for those of us in science).' On the up side, this also predisposes them to additional cancers and increased profit potential, making it possible for thousands of nurses, doctors, fund raisers, charities and pharmaceutical workers to keep jobs. Our thanks goes out to these brave women who choose the morally higher ground of helping many rather than selfishly using the so called natural cures that some claim end their cancer. These natural promoters do not realize the hurt they cause. With the "I will do what ever my doctor says mentality," the war on cancer is alive, well and cancer continues to win. If you are a stock holder, a stake holder or if you are employed by the cancer industry, then you should consider yourself safe at the present. And what about the fine print, the sub-text? 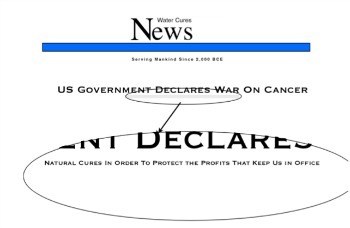 The US Government has Declared War on Cancer headlines did indeed have fine print under it. Here, we have made a blow up of the fine print. It is a war on cancer, but it is more completely called a war on cancer natural cures.